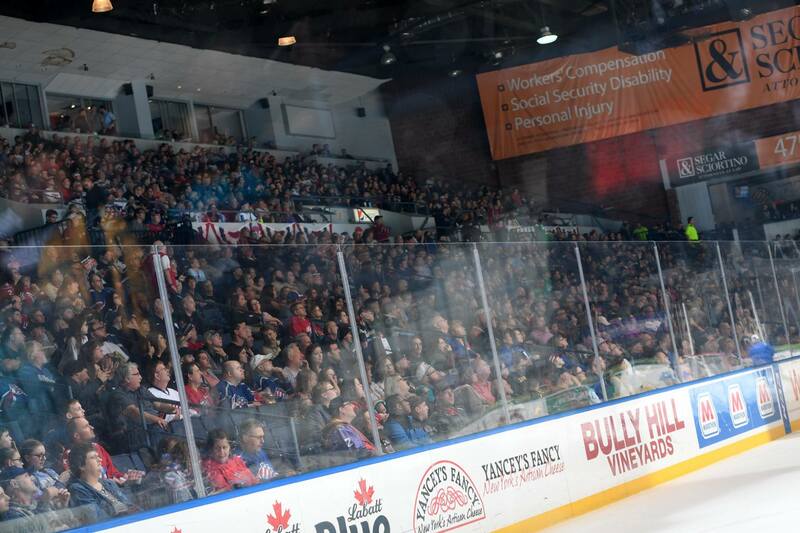 Amerks Had Some Performance Anxiety on Home Ice · Let's Go Amerks! The Rochester Americans have finished their regular season and after looking at the numbers they may want to think about limiting the number of tickets sold for Friday games in the playoffs. Not really. Well, maybe. Overall the team finished with a 21-17 (21-14-2-1) record on home ice. One win was on the road in Buffalo that was considered a home game. That is not going to be counted in the numbers below because the team played it as a road game. They finished with 46 wins and 99 points in the standings through 76 games. That’s good enough for top 10 all time in franchise history. They also finished with the third best record in the league this season. Only Charlotte and Syracuse finished higher than them in the standings. The success was fueled by the road record, the best in the league. On the road the team finished 25-9-3-1. The nine regulation losses tied the Toronto Marlies for lowest in the league. Rochester had two more wins on the road than Toronto. The Amerks home record ranked ranked 16th overall in the league. First round opponent Toronto ranked 25th with their home record of 16-15-6-1. If you’ve thought that Friday home game results in front of big crowds were bad you weren’t wrong. The team finished with a 6-1 record with under 5,000 people in attendance. The record with over 5,000 people was 5-8. Another way to look at it would be with over 6,000 they were 4-7 and under 6,000 they were 7-2. Any way you look at it the team did not perform with a decent size crowd (by current standards). Here’s a look at numbers by day. Through 20 Friday night home games the team averaged 5,873. As usual, attendance for Friday home games increased after Christmas. Unfortunately the record did not get any better. Before Christmas the team averaged 4,984 and had a 6-4 record. After Christmas the team averaged 6,763 and had a 5-5 record. Is there a connection to the opponent and crowd size? There doesn’t seem to be one. In 10 home games played on Wednesdays there was only one crowd over 4,000 and that was an overtime loss. One Wednesday game was played in Buffalo which resulted in a win. On paper the attendance was 15,965 but there’s no way more than 5,000 people were in the building. That game isn’t included because the team played it as a road game and the attendance numbers were throw everything else off. Maybe every road game should be played on Sundays and Wednesdays? After the last regular season home game Friday night the performance at home was discussed after the game. The playoffs start Friday on home ice. The first two games are at home. It’s time to click for three periods or end the season early. Again.